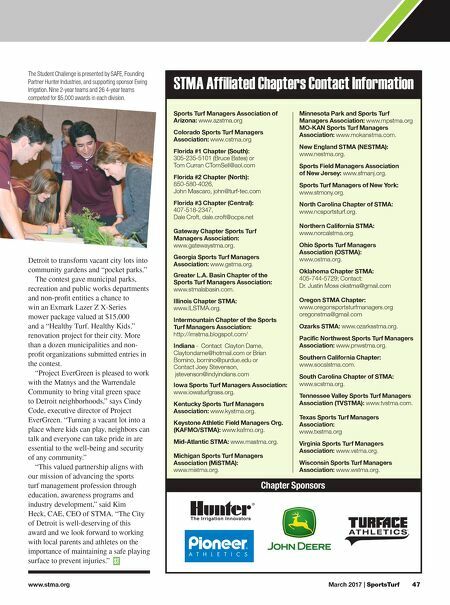 www.stma.org March 2017 | SportsTurf 47 Sports Turf Managers Association of Arizona: www.azstma.org Colorado Sports Turf Managers Association: www.cstma.org Florida #1 Chapter (South): 305-235-5101 (Bruce Bates) or Tom Curran CTomSell@aol.com Florida #2 Chapter (North): 850-580-4026, John Mascaro, john@turf-tec.com Florida #3 Chapter (Central): 407-518-2347, Dale Croft, dale.croft@ocps.net Gateway Chapter Sports Turf Managers Association: www.gatewaystma.org. Georgia Sports Turf Managers Association: www.gstma.org. Greater L.A. Basin Chapter of the Sports Turf Managers Association: www.stmalabasin.com. Illinois Chapter STMA: www.ILSTMA.org. Intermountain Chapter of the Sports Turf Managers Association: http://imstma.blogspot.com/ Indiana - Contact Clayton Dame, Claytondame@hotmail.com or Brian Bornino, bornino@purdue.edu or Contact Joey Stevenson, jstevenson@indyindians.com Iowa Sports Turf Managers Association: www.iowaturfgrass.org. Kentucky Sports Turf Managers Association: www.kystma.org. Keystone Athletic Field Managers Org. (KAFMO/STMA): www.kafmo.org. Mid-Atlantic STMA: www.mastma.org. Michigan Sports Turf Managers Association (MiSTMA): www.mistma.org. Minnesota Park and Sports Turf Managers Association: www.mpstma.org MO-KAN Sports Turf Managers Association: www.mokanstma.com. New England STMA (NESTMA): www.nestma.org. Sports Field Managers Association of New Jersey: www.sfmanj.org. Sports Turf Managers of New York: www.stmony.org. North Carolina Chapter of STMA: www.ncsportsturf.org. Northern California STMA: www.norcalstma.org. Ohio Sports Turf Managers Association (OSTMA): www.ostma.org. Oklahoma Chapter STMA: 405-744-5729; Contact: Dr. Justin Moss okstma@gmail.com Oregon STMA Chapter: www.oregonsportsturfmanagers.org oregonstma@gmail.com Ozarks STMA: www.ozarksstma.org. Pacific Northwest Sports Turf Managers Association: www.pnwstma.org. Southern California Chapter: www.socalstma.com. South Carolina Chapter of STMA: www.scstma.org. Tennessee Valley Sports Turf Managers Association (TVSTMA): www.tvstma.com. Texas Sports Turf Managers Association: www.txstma.org Virginia Sports Turf Managers Association: www.vstma.org. Wisconsin Sports Turf Managers Association: www.wstma.org. STMA Affiliated Chapters Contact Information Chapter Sponsors Detroit to transform vacant city lots into community gardens and "pocket parks." The contest gave municipal parks, recreation and public works departments and non-profit entities a chance to win an Exmark Lazer Z X-Series mower package valued at $15,000 and a "Healthy Turf. Healthy Kids." renovation project for their city. More than a dozen municipalities and non- profit organizations submitted entries in the contest. "Project EverGreen is pleased to work with the Matnys and the Warrendale Community to bring vital green space to Detroit neighborhoods," says Cindy Code, executive director of Project EverGreen. "Turning a vacant lot into a place where kids can play, neighbors can talk and everyone can take pride in are essential to the well-being and security of any community." "This valued partnership aligns with our mission of advancing the sports turf management profession through education, awareness programs and industry development," said Kim Heck, CAE, CEO of STMA. "The City of Detroit is well-deserving of this award and we look forward to working with local parents and athletes on the importance of maintaining a safe playing surface to prevent injuries." The Student Challenge is presented by SAFE, Founding Partner Hunter Industries, and supporting sponsor Ewing Irrigation. Nine 2-year teams and 26 4-year teams competed for $5,000 awards in each division.